This sjambok is "Township made". The people use plastic material (bags etc.) which is then heated up and rolled by hand. Thanks Alex for these informations! This sjambok has not the density and impact of the police version, but is still a dangerous weapon. 54" long, 30mm handle diameter, 10mm tip. Used, good condition. 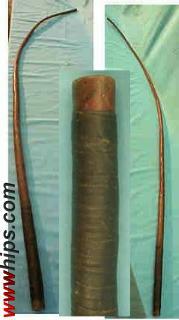 The pic shows two views of the whole whip and a section of its handle.